We began our first Great Loop trip in October 2003. 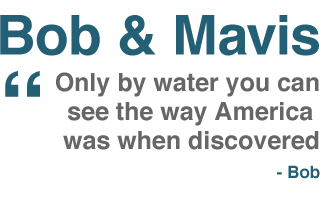 The most interesting finding was that only by water can you see America the way it was when discovered. The country developed along the coasts and rivers. We traveled in the Katy Leigh a 36 ft Grand Banks trawler for 6 months over a 2 year period. We will never forget the people we met and the small towns we stayed in. Since that trip we cruised the Tennessee and Cumberland Rivers. In 2007 we decided to continue our adventures in a small 23 ft Winnebago View motor home making great loops from Nashville to Newfoundland, Vancouver Island, California, Florida. Alaska, and the Four Corners area. See some of our favorite photos from our trips in the slideshow below. Bob and Mavis Duthie have produced an interesting and entertaining travelog of their tour through the southwestern USA via their motorhome. This video series is useful to anyone touring the area by vehicle, whether in a recreational vehicle or not. The Duthies highlight the scenic, historical, cultural, geographic, geologic, and the everyday useful attractions of the areas they have traveled through and the best ways to get around. Whatever you are looking for: be it a campground, a restaurant, the local laundromat, the best sights and tours in the national and state parks or even the eclectic tourist traps and attractions along the way, these videos will help you find what you seek. Bob and Mavis even cover inside tips such as which side of the Silverton-Durango train to sit on in order to get the best views in their own relaxed yet informative style. Each route is divided up into easily doable segments that cover a day or so's travel and what not to miss along the way. As both a planning tool for your trip and a great remembrance of what you have seen, this video series is something you will be glad to have. It's a great reminder of what I saw in the past and an incentive for us to make the trip to see it again. Thanks go out to the Duthie's for presenting this Southwest primer for everybody's enjoyment. The first time through, we watched the travels, just enjoying the experience of being with Bob and Mavis, seeing what they saw and enjoying the scenery. We enjoyed learning about their motorhome, sharing with them the joy of traveling in their View. The second time through, we got out the road atlas and followed them in a more detailed fashion, seeing exactly where they went, stopping periodically to research some issue or investigate alternatives. This seems to be a natural progression for making the best use of the travel helps from Bob and Mavis. We have been to several of the locations covered in this series. We have traveled some of the routes they covered. However, Bob and Mavis have showed us sights, histories and flowers we missed on our travels. They have the interest and skill to look deeper into the history, the features, the flora and fauna of the area being visited plus the ability to share it with us in an engaging fashion. We want to go back there and see what we have missed. Seeing some of the sights and names brings back memories of our travel in those locations. For example, Walsenburg, Colorado was where, when we were traveling with my brother and his wife, we stopped looking for help for his reluctant 5th wheel trailer slideout. Fortunately, we were able to get it fixed there. Yeah, that was the place, an RV repair shop in a Quonset hut, Walsenburg, Colorado. The technique they have utilized to share their travels with us works well. Bob continually lets us know the month and day they visit these locations so that we can schedule our own visit to these locations. Occasional videos punctuate the still photo presentations with movement and sounds. Mavis inevitably points us to native flowers and shrubs growing alongside the roads and paths. Her interest in and knowledge of these plans is a helpful addition. Having our own RV, we appreciated the Duthie's campground observations, where they stayed and what the campgrounds were like, where they made reservations. Even curious-looking RVs they saw in the campground were the same ones we would wish to know more about. This afternoon I clicked through all of your fine photos. Seems to me your account would have great value to anyone contemplating the trip and as a memory stimulator for those of us who have already done the trip. I walked through the photos and can appreciate the homework you did and the photographic attention you mustered. Navigating the CD was intuitive and I had no trouble with the viewing process, Your photos were wonderful and the trip segments were explained in clear detail. We who have made the trip are undoubtedly members, by default, of a small unique boating fraternity. I had my Mom look at Great Loop CD-ROM over the weekend. The content is "incredibly engaging" … once she started watching the content, I couldn'’t pull her away. In fact, she watched the tour until she exhausted the battery in my Powerbook (almost 2 hours), and still wanted to see more. Later, when cousins stopped in for a visit, she insisted that I get the Powerbook out and show them parts of the tour as well. I think you’'re on to something with your Great Loop CD – we didn’t come across any glitches or technical problems – all ran smoothly and it’s easy to stop and start and go back over previous pictures/segments, etc. My father’s birthday is coming up soon – we want to buy him a copy as a gift. I congratulate you on a job well done. The photography is technically and esthetically solid. All too often, such a presentation is strong in one respect but weak in the other. But that doesn't happen here. I was particularly impressed by the consistently good composition. Your pace and balance hit squarely in the middle. There's something for everyone but not too much of any one subject. You keep things moving without hurrying too much or glossing over significant information and impressions. The give and take narration between you and Mavis is about right, too. Input from you both add what I consider a necessary dimension. You skillfully and smoothly blended all information. Nothing grates or irritates. And after watching a segment, you know what you have seen and heard is an accurate portrayal of reality. I believe it's the best available preview for anyone planning to cruise the Loop and will prove to be a most helpful companion when they finally get underway. I believe it's the best available preview for anyone planning to cruise the Loop and will prove to be a most helpful companion when they finally get underway. I'm mad at you Bob! I got your CD yesterday and I can't stop watching it. I always say just 5 more minutes and 2 hours later I'm still watching. The pictures are nice in that it's more like family vacation pictures rather than professionally staged boring photos. I find the commentary, short, sweet, and right to the point and it seems to always hit the important points. Bob and Mavis have showed us sights, histories and flowers we missed on our travels. They have the interest and skill to look deeper into the history, the features, the flora and fauna of the area being visited plus the ability to share it with us in an engaging fashion. We want to go back there and see what we have missed.